Londolozi Founders Camp is situated on the banks of the Sand River in the game-rich Sabi Sands Game Reserve, South Africa, and is easily accessible by either road or air. This camp in the Londolozi Game Reserve is located within the Sabi Sand Private Game Reserve, South Africa. This area covers a sector of the Greater Kruger National Park and features exclusive rights over prime game viewing land. The Sabi Sands Game Reserve and the Kruger National Park form part of the Greater Limpopo Transfrontier Park in South Africa. This vast area is growing but currently encompasses 6 million acres. 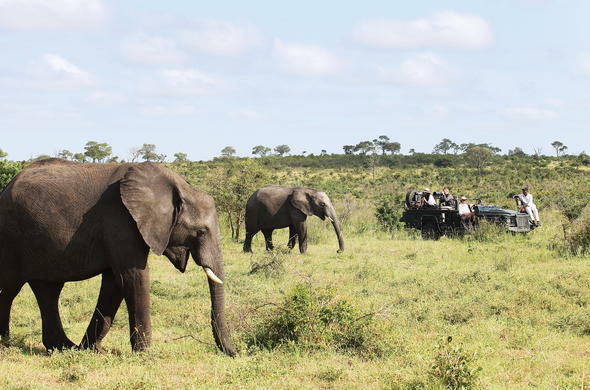 Guests can fly from Johannesburg OR Tambo International Airport to Londolozi Airstrip. There are also flight options from Johannesburg, Durban and Cape Town to Nelspruit (Kruger Mpumalanga International Airport – KMIA). For guests to bring their own aircraft there is an Indemnity Form to be completed prior to arrival. Take the N12 / N4 from Johannesburg to Nelspruit. Take the R40 from Nelspruit to Hazyview. Once in Hazyview take the R536 towards Paul Kruger Gate. After 37.4km (23.2 miles), turn left onto the gravel road. Follow the signs to Shaws Gate and the Sabi Sand Game Reserve. After you have paid your entrance fee, follow the signs to Londolozi Founders Camp, approximately 28km (17.3 miles). Please Note: There are cash only entrance fees payable for entrance into the Sabi Sands Game Reserve. The camp has become world famous through the truly remarkable relationship which has developed over three decades between wild free ranging Leopards and the rangers and trackers.